Coupon must be presented at time of purchase. Plus tax. Not valid with any other offer. Limited to stock. See dealership for details. Void where prohibited by law. When winter comes to the Midwest, it's serious business that your windshield wipers work well. They may not seem like much, but windshield wiper blades are crucial to your Toyota safety system. At Eddy's Toyota, we have Mighty Tec-Select Aero Wiper Blades in our parts store for only $13.99 each. These windshield wiper blades use OEM-style molded rubber squeegee that withstands extreme heat and cold, so they last longer than plastic or metal/plastic blades. The design is more secure, because all connectors lock onto the blade with a strong snap-lock system. You can get your Mighty Tec-Select Aero Wiper Blades at Eddy's Toyota of Wichita today! Eddy's Toyota of Wichita is your one-stop source for all things Toyota. That includes quality replacement parts and practical accessories to personalize your Toyota. At our parts store, you'll meet a friendly and professional staff that's ready to help you find what you're looking for. Our professional technicians can also install your parts or accessories for an additional fee. You can always call our parts center with your questions, or to put an item on hold, at (316) 652-2226. 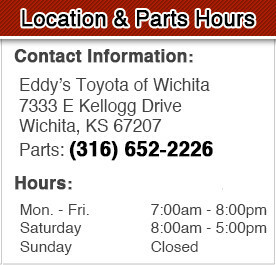 Eddy's Toyota is located at 7333 E Kellogg, Wichita, KS 67207, serving Hays and Salina. We're also proud to have customers from the Oklahoma areas of Tulsa and Enid. Come on! Come on! Get Eddy-fied!